How Much Fish Oil Should You Take Per Day For Benefits? Taking fish oil? Are you noticing results? Please take a moment to go grab your fish oil supplement, if you’re taking one, and then keep reading to find out if your fish oil is living up to your expectations. Omega-3s are made up of a spectrum of nutrients, including EPA and DHA, two polyunsaturated fatty acids. EPA and DHA are the powerful workhorses of the omega-3 family, and have been researched extensively for their role in lowering triglyceride levels and blood pressure, improving mood and mental health, and helping reduce pain and inflammation. To make a noticeable difference in your health, the daily fish oil dosage for adults should be from 2000 to 3000 mg of EPA and DHA combined. This level should be taken consistently, with food, for approximately 8 to 12 weeks before the effects will start to kick in. Now, take a look at your omega-3 supplement. Add together the total number of mgs of EPA and DHA per serving. How many capsules per day do you need to swallow to reach that 2000 to 3000 mg mark? For most brands, the actual dosage that you need is significantly higher than the normal recommendation of 1 or 2 capsules listed on the bottle. One of biggest misconceptions with taking fish oil is the dose necessary to produce results. In this video, Dr. Bo Martinsen explains the omega-3 dose deception, comparing how many fish oil and krill oil capsules you would need to swallow to equal the amount of EPA/DHA found in a salmon fillet. Why is it necessary to look at the levels of EPA and DHA, as opposed to the total amount of fish oil? Remember that fish oils only contain a certain percentage of omega-3s, depending on the source of the oil, how it is processed and how fresh it is. Typically, a natural fish oil will contain at most 30% EPA and DHA combined. So if your capsule contains 1000 mg of fish oil, that means you are only getting 300 mg of EPA/DHA. The reason we care so much about the amount EPA and DHA is that almost all medical research to date has focused on those fatty acids, even though they are not the sole members of the omega-3 family. Whenever a new study comes out showing benefits for fighting cancer, dry eyes and improving mental health, it is almost always the EPA and DHA that are being discussed. However, research also shows that the benefits of EPA and DHA are dependent on the dose administered. In fact, numerous studies indicate that the anti-inflammatory benefits of the omega-3s don’t kick in unless you consume at least 2000 mg each day. For certain conditions, like arthritis and high triglyceride levels, studies routinely use between 3000 to 4000 mg of EPA/DHA daily to see meaningful results. And for other diseases, like cancer, the dosages can go even higher. *Level of EPA/DHA depends on the fish species, the time of year, how the fish is prepared, whether it was farm raised or wild caught, etc. If you are getting distressed looking at this table and imagining swallowing all those fish oil pills, remember there are alternatives to taking capsules. For instance, a fresh cod liver oil, like Omega Cure®, delivers 3000 mg of EPA/DHA in three teaspoons and has no fishy taste or smell. Similarly, increasing your intake of fish is a great way to get enough omega-3s. If you do go that route though, you have to pay attention to the fish species and how the fish is prepared to ensure you don’t cook the majority of omega-3s out of your meal. Most people around the world, and in the USA especially, get far too little omega-3. But if you do go on an omega-3 binge, the European Food Safety Authority has concluded that consuming up to 5000 mg of omega-3s daily is safe. How Fresh Is Your Fish Oil? Now that you know the amount of fish oil you need, let’s turn our attention to the freshness level of the oil that you’re taking. This is important because freshness impacts potency and safety. Unfortunately, rancid omega-3 oil is all too prevalent today. In fact, independent studies from around the world have concluded that the majority of omega-3 products exceed industry freshness standards at the time of purchase. Rancidity is concerning from several perspectives. For one, as your omega-3 supplement goes rancid (or oxidizes), the amount of EPA and DHA in the oil also decreases. In other words, if your fish oil supplement is rancid, you are likely getting less omega-3 than the labels suggests. More concerning though it that rancid oil can have damaging effects on your body. For instance, at least two studies to date have found that rancid fish oil has a negative impact on cholesterol levels, whereas fresh fish oil delivers the expected health benefits. Other studies have found that rancid fish oil can increase risk factors for Alzheimer’s disease and cancer. To learn more on this important topic, read Rancid Fish Oil May Hurt More than Help, Research Shows. In the world of fish oil, peroxide values measure an oil’s freshness level. While the omega-3 industry has stated that an omega-3 oil should never exceed a peroxide value of 5 mEq/kg, several international studies have determined that most brand far exceed that value at the time of purchase. To figure out if your fish oil is fresh, start by doing a taste and smell test. All oil, regardless of initial quality, will oxidize with time and exposure to oxygen. But, if the oil is not heavily flavored, you will often be able to get a good sense of the quality by using your senses – just like you would fish or milk. Take one of your fish oil capsules and split it open. Smell and taste the oil. Fresh fish oil should have minimal to no smell. Long story short, if your fish dinner smelled and tasted that way, would you eat it? If the answer is no, toss the capsules. Secondly, check to see if your oil lists a “Peroxide Value” or PV, which is an indicator of freshness in the omega-3 world. Scientists are still debating what an acceptable PV level is. But, as a general rule, the lower the PV number, the fresher the product. 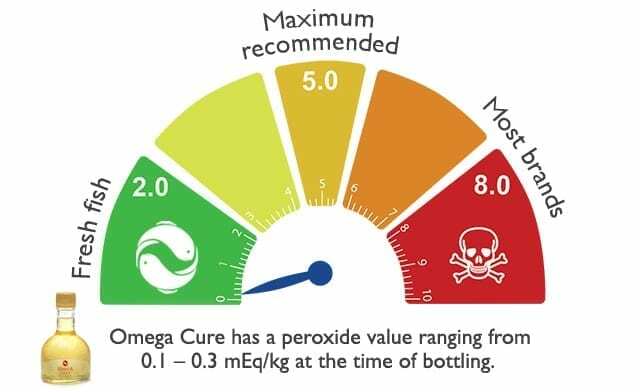 For instance, Omega Cure has a PV level of 0.1 – 0.3 mEq/kg at the time of bottling, making it about 80 times fresher than your typical omega-3 supplement. Fish and natural fish oil contain a wide range of beneficial fatty acids. 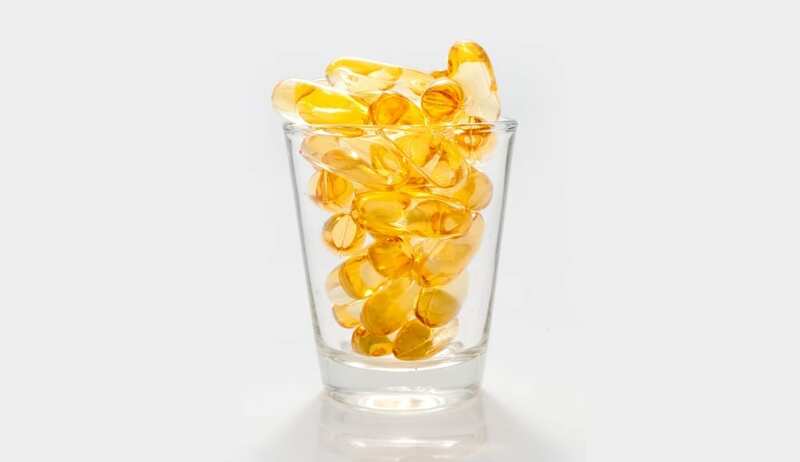 Besides featuring a cocktail of omega-3, 6, 7, 9, and 11 in the proper ratios, fish oil also contains at least nine different types of named omega-3s – from the aforementioned EPA and DHA to the lesser known ALA, DPA, SDA, and the likes. All of these fatty acids and their derivatives flourish in natural fish oil and cod liver oil, providing a wide range of nutrients for the body to absorb and enjoy. In its natural state, fish oil should provide the same mix and fatty acid content as fish. But just as drinking filtered orange juice is not as healthy as eating a fresh orange, the more you process the oil, the less nutrients it eventually contains. For more information about getting a full-spectrum oil, read Full-Spectrum Fish Oil: Why It Matters to Omega-3 Consumers. Increasing one’s intake of omega-3s is a wonderful way to improve health, be it for dry eyes, arthritis, or lowering triglyceride levels. But if you are hoping to experience results, it’s important to pay attention to the dose and quality you are getting with your supplement. If you haven’t already, try Omega Cure. With the lowest oxidation levels on the market, it is the freshest omega-3 oil available. And with no fishy taste or smell, it is easy to enjoy in juice or yogurt or drink straight. You can learn more about how Omega Cure is made here. Thank you, thank you, thank you for listening to people like me who travel. I can’t wait for,the new travel vials to be introduced. How long is the shelf life? Am I right in assuming that they do not have to be refrigerated? Will the green tea be counterproductive to people who cannot ingest caffeine products? For treatment of dry eyes,how much omega-3? How long to see a beneficial change in dry eyes? I take Vitamin Shoppe Omega 3. 600 EPA/240 DHA. Total is 1200 mg per capsule. I take 2 in the morning and 2 in the evening. Is this enough? My numbers have slightly increased but I was hoping for better results. I am 6’2 and weigh 250. My bp is perfect but my good cholesterol is lower and I need to raise it. Just started a better diet and been in the gym 5 out of 7 days starting a month ago. Should I take more? Me and my 8yr old daughter are desperately trying to lose weight. Is it safe to give her fish oil..
it is ok for the child has a ASD or autism disorder? Hi, I have high cholestorl and high blood pressure. Dont want to take statins. How much should I take to lower the cholestrol. I also take soy lecithin. thanks. If you take 3 teaspoons of Omega Cure every day, it provides a safe and potent dose of the only fresh, full-spectrum fish oil in the world. After 4 to 5 weeks, you can measure the changes of the blood lipids and your blood pressure. Take the triglyceride value and divide by the HDL cholesterol value. If the resulting number is below 2.7, you are in good shape. Thank you so much for your fantastic articles, Can you please advice me on how many tablets of omega-3 should I consume per day? I had read that a recent study reported a correlation between fish oil supplementation and increased risk of prostate cancer. Is this something I should be concerned about? I am 26 years old.I have started taking one capsule of Blackmores Fish oil (Omega 3) which is 1000 mg & it says it contains 180 mg EPA and 120 mg DHA. How much omega 3 should i take daily for good results ? Can you tell me if your product has Reservatol in it? My father has had a stroke paralyzing his left side and causing aphasia. I would like to get him on Omega3 as soon as possible to help not only with brain function but also with muscle loss. However, if Reservaol is an ingredient he will not be able to take it as he is on the highest level of blood thinners possible. Hi Lina. Omega Cure is not Halal or Kosher certified. However, as a pure cod liver oil, manufactured with equipment solely used to produce Omega Cure, it should meet all halal and kosher requirements. I am 35 and my daughter is 13 & 7 years old. Currently our fish oil has 1200mg fishgel capsule contains EPA 396mg , DHA 264mg, total omega 3 fatty acids 660mg, vitamin E 2IU. Fish oil sources, coldwater fish( Anchovy, Sardine & Mackeral. Gelatin source, fish. How many capsules should we take individually per day? Thank you. my husband suffers from depression, he takes 4×1500 mg tabs .is that enough? Is 1250mg EPA + 500mg DHA 3 times a day too much? If you are taking 1750 mg of combined EPA/DHA three times a day (over 5000 mg of EPA/DHA daily), that is quite a heavy dose. It’s likely not harmful, if you are taking a fresh omega-3 product. 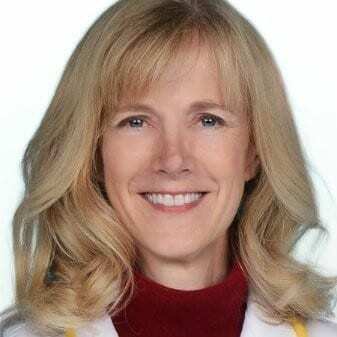 According to the European Food Safety Authority, consuming 5000 mg of omega-3s “raises no safety concerns for adults.” However, it’s always best to speak with a health professional to see if that is the best dose for you. Why do you not state the number of mgs of dha & epa per teaspoon ? You only provide a total’combined amount. Consumers want specific info and you intentionally side step this most important info. Lovaza prescription omega 3 has 480mg epa and 360mg dha per capsule. All other otc manufacturers provide this info. This tells me you are hiding something. Hi, my mom bought fish oil capsules for me the other day. I just consumes it without knowing that taking 3 capsules everyday can give me a good effect or not. Based on the prescription, each softgel capsule contains 1000 mg fish oil (18%EPA/12%DHA). Is it okay that i just need take 2 or capsule per day? This is not comment but a question. On the bottle of fish oil capsule it is written for better health from 3 to 12 capsule daily with food. in the bottle there are 200 capsule. But for how long one should take these capsule. Is this for whole life, or is this for winter season only or is it one bottle once a year. on the bottle this literature is not clear. I am living in Pakistan, here even doctors have no clear concept. Please inform me about the correct doze daily and for how many weeks. Hi Nisar, This is a tough question to answer because there is no one-size-fits-all solution. However, to answer you generally, most people need to be conscious about their omega-3 intake throughout their life. This is particularly true if you eat a typical Western diet heavy in processed foods and low in fish. That being said, you also need to be concerned about the quality of your omega-3 supplement if you continue consuming capsules. Please read: Is Your Fish Oil Rancid? can u suggest me whether my 6o years old father can have the omega 3 fish oil capsule or not ? If yes then what is the recommended serving size ? We generally recommend that people seek out a fresh liquid omega-3 oil, like Omega Cure, instead of capsules. Liquids are easier to swallow and they make it easier to get an effective daily dose. In addition, Omega Cure is much fresher than the oil you find in regular fish oil capsules. However, for specific recommendations for your father, we advise you to contact a medical professional who can evaluate him in person. Is your oil purifies to remove mercury ? Yes, every batch of Omega Cure is purified to remove mercury and other pollutants. After the purification process, it is third-party evaluated in Norway to ensure the oil meets all government and industry standards for contaminants. Hi there! Informative article, but my doubt is that I am consuming a product of Omega 3 1000 mg capsules (2 per day) which contains around 330 mg of EPA and 220 mg of DHA. How many capsules can i take per day actually? Or is this dose Sufficient to cure skin diseases? Hi. How much Omega 3 to take to raise my HDL level ? The total cholesterol, triglycerides and LDL level are OK. Only the HDL is low 35 mg/dl. Hi Robert! While the triglyceride-lowering benefits of omega-3 supplements have been well documented, the data is less consistent with regards to LDL and HDL levels. 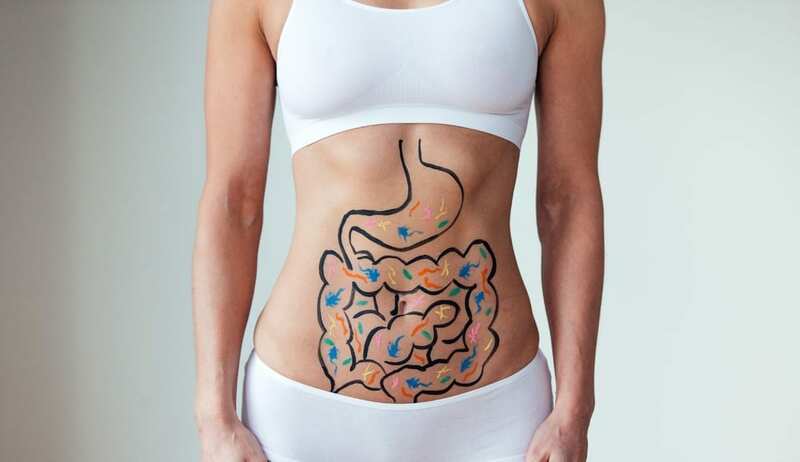 Likely, this means that other factors, like the freshness level and the fatty acid composition of the supplement, will have a stronger impact on the results. 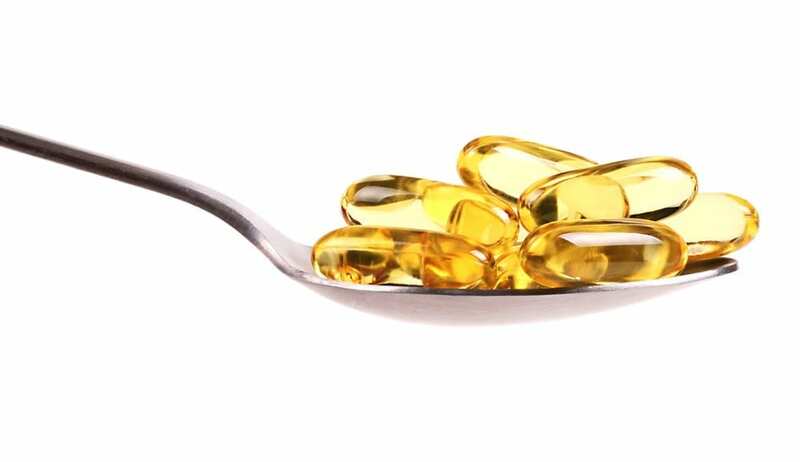 That being said, when we survey some of the research on omega-3 supplements and HDL levels, studies have reported modest increases when using doses ranging from 2000 – 4500 mg of EPA/DHA. Most of the studies are in the 4000 mg range. Woow. One of my capsules contains 70mg of EPA and 45mg of DHA.